This is an introduction to the different types of steam cleaners that exist; jewelry, grout, high pressure, heavy duty steam cleaners,clothing steamers and more. When you take a look at the steam cleaning equipment available in the market you might conclude that their only purpose is to get rid of the deeply embedded stains on carpeted floors but there are so much more to steam cleaners than cleaning carpets. Most types of steam cleaners are multi purpose machines and are capable of a multitude of cleaning jobs but there are steam cleaners which are specifically designed for specific tasks such as furniture steam cleaners. Some can be used for cleaning grout while other models double as a jewelry steam cleaners. To give you an idea about the different types of steam cleaning equipment that you can use, take a look at the list following below. It is easy to see just how powerful steam is for cleaning when you look down this list. When used to clean clothes, steam does away with the abrasiveness of commercial cleaners – making it a gentler and more penetrating cleaning aid. Visit our clothes steamer page for more in depth information about fabric steam cleaners. The Jiffy Steamer J-2000 does a nifty job of getting rid of the wrinkles from silk, cotton and other light fabrics and can even be used to steam your bed. It is ideal for home use but can also be used for light commercial steaming. It has a quick heat up time of around 2 minutes and will allow you to steam for up to one and a half hours. The unit is durable, gives you great value for your money and does not produce the leaking problem which many consumers complain about with other clothes steam cleaner models. Our jewelry are close to our heart as it is usually cherished gifts received from a loved one or jewelry that we bought because we were attracted to it because of its beauty or value. Keeping our jewelry looking like new is therefore important and a must do. Steam cleaning is the ideal way to clean your jewelry because it doesn’t require chemicals or jewelry cleaning solutions. All you need is to use tap water which, when turned into steam, will restore the shine and lustre of your jewelry pieces. 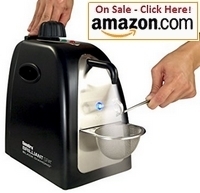 Read more about Jewelry Steam Cleaners here. High pressure steam cleaners are usually meant to be used in industrial applications, commercial-grade applications or heavy-duty residential cleaning applications. 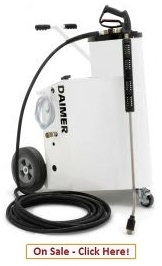 You can use this type of steam/high pressure cleaner for cleaning engines, patios, removing wall graffiti and a host of other heavy-duty cleaning jobs. Manufactured by Daimer Industries, the Super Max 6000 is a machine which has heavy gauges and stainless steel coils. It has a unique tri-mode pressure washer system which combines steam, cold water and hot water pressure to address any kind of cleaning job that you want to finish. It doesn’t come cheap but is a real powerhouse for when you are serious about high pressure cleaning and need a reliable work horse that will last. One of the most undesirable cleaning jobs in the household is getting rid of grout stains. Grout is the glue which holds your tiles in place – which is usually porous and prone to accumulating dirt. One of the best ways to get rid of these unsightly stains which are usually found in bathrooms and kitchens is to use a bathroom steam cleaner for cleaning grout. 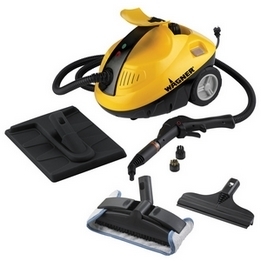 The Wagner 915 steam cleaner is a portable steam cleaner which is lightweight and handy. 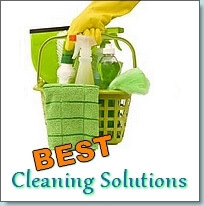 It offers a quick fix for jobs like cleaning grout, bathroom tiles, kitchen tiles, stove tops, windows and mirrors. It has a 1500-Watt broiler which blasts away mold and mildew. Finally, you can keep your upholstered furniture pieces looking clean, fresh and new by using upholstery steam cleaners. It cleans upholstery just like it does carpets – as the steam deeply penetrates through the layers of foam, fiber and fabric. 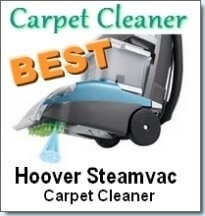 Read more about upholstery steam cleaners here. 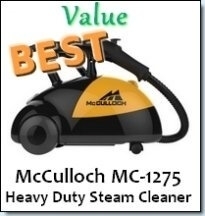 There are many great upholstery steam cleaners but the Mcculloch is one of the highest rated and most affordable. The McCulloch steam cleaner has 1500-Watts of steaming power, does not require chemicals and can be used to clean not just carpets but also upholstered furniture pieces and whatever else you need to clean. Read more about the McCulloch MC-1275 here. 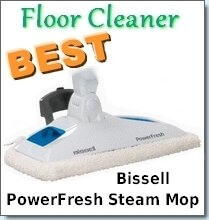 A guide to finding steam cleaner parts including: Hoover, Bissell, Scunci, Mcculloch and other accessories. A review of Jenny steam cleaners and their long history of excellence. The Jenny steam cleaner has come a long way and is still a great choice up to this day. These miniature steam cleaners are popular for people constantly on the move or simply want to quickly clean spills and messes. These machines may be small and cute, but they are completely functional.